It’s official. The Smithsonian’s crowdfunding campaign to preserve and display Neil Armstrong’s Apollo 11 spacesuit ended early this morning. And it was such a huge success, they’ll be restoring Alan Shepard’s suit as well. The Smithsonian smashed through its goal of $500,000, ultimately raising $719,799 from 9,477 contributors. The campaign, called “Reboot the Suit” was launched last month as a crowdfunding effort to complement its other fundraising. The Kickstarter money will help pay for the museum’s upcoming Destination Moon exhibition (slated to open in 2020), which will now include both Shepard and Armstrong’s suits. They’ll both be 3D scanned, conserved, and displayed for generations to come. What’s next for #RebootTheSuit? It’s time to get to work! 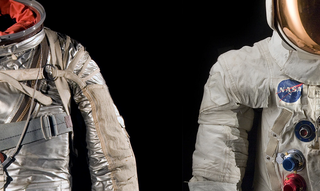 Stay tuned in the coming weeks, months, and years as we share what we discover about these two incredible spacesuits. Please keep looking out for our updates. We’ll also be sending out surveys soon to collect the information needed to deliver your rewards. As I noted last month, the Smithsonian has had quite a few failed attempts at making crowdfunding work over the years. But they finally seem to have figured out the formula, including reward levels that include things that people actually want. Like this patch designed by Mike Okuda. Critics who take issue with the Smithsonian using crowdfunding should probably remember that the museum does private fundraising all the time. “I feel like it’s a pretty sad commentary on the current state of affairs when our country’s most prestigious museum has to hold it’s hand out in order to perform restoration work on one of the most important historical artifacts of the Space Age,” one commenter said back in July with what I can assume are the best of intentions. But, again, the Smithsonian has always done private fundraising. And if you see this as an extension of that, arguments against using Kickstarter are actually pretty dumb. So we need to stop whining and just enjoy the fact that space history is being preserved. Seriously, just stop it and enjoy something for once in your life. The Smithsonian has finally figured out crowdfunding and we’re all going to benefit from it.